Sfiso Cebekhulu, a second-year Homeopathy student at the Durban University of Technology does wonders behind the decks. He proved this during the News Cafe DJ search, held between Durban and Johannesburg in September (2013), where he was dubbed champion. Cebekhulu, otherwise known as DJ Fhiso, auditioned in Durban and easily landed a spot in the top eight after battling it out with other DJs at News Cafe in Umhlanga. His victory gained him a spot in the finals, held in Midrand Johannesburg on September 27. The 23-year old received a bursary to study music production at Boston City College as well as R10 000 from recording label Soulcandi. Elated, Cebekhulu said he longs to establish his own production company in the future, thus this study opportunity and money will pave the way for him to fulfill this dream. Cebekhulu is not the first DUT student to break into the music industry. Nkosinathi Maphumulo, famously known as Blackcoffee, and Thokozani Ndlovu, known as Lvovo Derango, are examples of alumni who heeded their music calling after their time at the University. 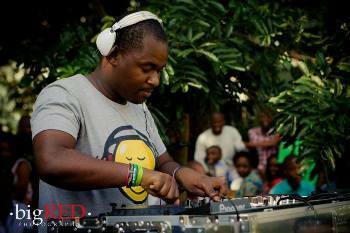 DJ Fhiso is currently one of the resident DJs at Boulevard night club on Florida Road in Durban. Here, he plays with the likes of DJ Tira, Dreamteam and DJ Shimza. Pictured: Sfiso “DJ Fhiso” Cebekhulu behind the decks at the DUT Steve Biko Campus during the Red Bull Campus clash.